Can I use an Ethernet connection for my iPhone or iPad? to a network via an Ethernet RJ45 LAN cable – or hardwired as it is commonly known. This means that you can access the Internet without using Wi-Fi or your cellular data. For this, we purchased and assessed the Foinnex Lightning port to RJ45 Ethernet network adaptor. Hardwiring allows the usage of a normally wireless iPad or iPhone through a secure network Ethernet cable connection with the device in Flight/Airplane mode and all antennas switched off. Our testing showed that it was a faster connection than Wi-Fi or cellular data, averaging 200 percent of the speed of a wireless connection, with almost no interruptions in connection service. 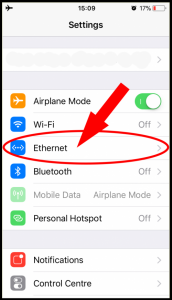 When plugged into the lightning port on the Apple device, in the Settings menu a new connection will appear labelled ‘Ethernet’ (as below) which will automatically assign an IP address to the device and start communicating. 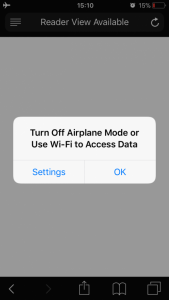 Even when using Apps when hardwiring your device, you will sometimes see a message saying that the device is in Flight/Airplane mode (see screenshot below). Simply OK this message and ignore it, because the App will run seamlessly over the Ethernet link. The Apple operating system(iOS) will take care of it. For those who are ‘in the know’ with regard to microwave radiation exposure levels from wireless devices, it enables hardwiring of iPhones and iPads without exposing the user to any significant level of microwave radiation. This hardwiring solution works for accessing the Internet and texting with other Apple users. To make a phone call without radiation exposure, we recommend using an App such as Skype or WhatsApp whilst on the Ethernet link. 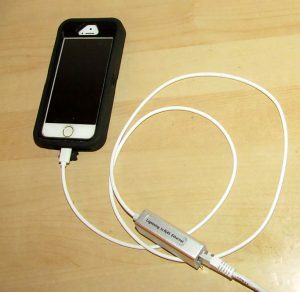 The cable adaptor does not need external power, running directly off the Ethernet link created between the iPhone or iPad and the local network cable. To purchase these adaptors search on Amazon for: ‘Lightning port to RJ45 network adaptor’. A number of recent research studies indicate that long-term microwave radiation exposure from wireless devices could affect your health. For detailed information on how and why this occurs, take our Schools and Families Course. This e-learning course covers medically recommended best practice guidance for reducing risks and using safer technology solutions. It costs less than the price of a movie ticket, and should take approximately 40 minutes to complete. Disclaimer: Always check the manufacturer’s website to ensure that the adaptor will work with your device, that the port is compatible (correct) and that the operating system version is compatible. Wireless Education does not endorse or recommend products, however we seek to understand and explain in simple language all technology innovations which will reduce microwave radiation exposure levels.